Los Angeles– October 1, 2010 – Glasgow-based Billi Productions Ltd. announced today the completion of the musical score composition and orchestral recording for “Sir Billi,” Scotland’s first full-length animated feature film that is now in the final stages of post production. Internationally recognized film composer Patrick Doyle wrote the score, working with the film’s husband and wife creative team, Sascha Hartmann, who directed the movie, and Tessa Hartmann who wrote the script. Patrick was inspired to write the theme to the original score on the spot, as the melody of the theme came to him while speaking with Sascha Hartmann about the direction of the score—something Doyle says has only happened twice before in his career. “Being a part of Sir Billi meant so much because animation has always been a fascination of mine especially because I am from Scotland and know all of the areas where the film is based,” said Doyle. “Sir Billi” is an adventure story about the power of a remote Scottish community held together by an eccentric, skateboarding and retired veterinarian played by Sir Sean Connery and their race to save an illegal fugitive – Bessie Boo the Beaver. Sir Billi braves treacherous ravines and hazardous waters as he and the village clash with the law in their fight to rescue Bessie. The husband and wife creative team were also very involved in the soundtrack for the film, with the five original songs in the film composed by Sascha, and the lyrics written for the songs by Tessa. The first song announced and opening title track of the film, “Guardian of the Highlands,” was performed by Dame Shirley Bassey and produced by the film’s director Sascha Hartmann. Best known for recording the theme songs to the James Bond films Goldfinger, Diamonds Are Forever, and Moonraker, Bassey is once again teaming up with Sir Sean Connery, who lends his voice as Sir Billi, the lead character in the film. When tragedy strikes in the Scottish Highlands, there can be only one man for the job - Sir William Sedgewick, aka Sir Billi (Sir Sean Connery)! An adventure story about an inimitable Highland hero – a grandpa and active senior skateboarding veterinarian who goes above and beyond the call of duty fighting villainous policemen and powerful lairds in a battle to save an illegal fugitive – Bessie Boo the beaver! The heart-warming and hilarious action-packed family movie, where thrilling car chases, heroic skydiving and daring stunts from this octogenarian, fueled with encounters with a hostile submarine, will keep you at the edge of your seat! 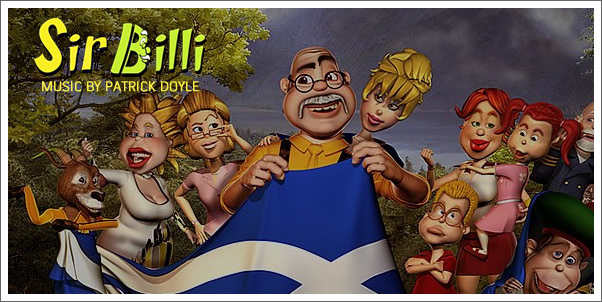 Billi Productions Ltd was founded in 2005 by Sascha and Tessa Hartmann, Sir Sean Connery and John Fraser (investor) to own the copyright and all film rights to the intellectual property that is “Sir Billi.” Production is being carried out by parent company Glasgow Animation Ltd., an independent studio based just outside Glasgow. This small animation studio is a wealth of young and ambitious creative talents who have produced Scotland’s first full length animated feature in-house. To learn more about Billi Productions please visit: www.billiproductions.com.